What’s your daily admin routine? COFFEE COFFEE COFFEE. It gets me through all my admin adventures. I work through a few category changes and rotate photos and do spell checks. PM’s make communicating so simple on VarageSale.Promoting VarageSale is very important to me and I focus a lot on that. I post my own ideas as well as the wonderful shares from the VarageSale Fan Page or new items from the blog. I’m always very diligent when it comes to letting new members into the community. The community cannot grow without them, so it’s very important to stay on top of. Now, being from the Volunteer State of Tennessee, my volunteer duties go beyond supporting college sport teams and being a VarageSale Admin. I love helping the community, even when operating in relative anonymity as a volunteer firefighter. When duty calls, all else is sacrificed. For myself and the other volunteer firefighters, we just get it done as it needs to be.Volunteers are in the “serve and nurture” business and that takes a lot of time and a lot of energy. The VarageSale Team is the greatest in easing the stress of providing admins the tools they need. If you had an admin superpower, what would it be? Teach the world to love VarageSale and close the other platforms, then the whole world will be at peace within the Big Red Heart that we all know. What’s your favourite VarageSale feature and why? CATEGORIES. I love that everything has a place and it is so easy to find. It is the #1 thing that sold me on VarageSale in the beginning. It makes shopping and selling easier than on any other platform. Then the VS Team had to bring along the “My VarageSale Store”. Nothing like keeping us on our toes. What’s the best item you’ve found on VarageSale? This is hard, there are so many neat items. I mostly buy toys for the grandchildren and have found the best savings. When they’re little, the cost is not as important as the joy they get from Mimi giving them something new. But the best item was really a lawnmower from a neighboring VarageSale community when we just had to have one. Even VarageSale admins take care of each other. What is the most interesting thing you’ve seen for sale? Antiques & Collectibles is one of my favorite categories as I pride myself in having a “Cracker Barrel” style home. That’s something most Southerners will understand. 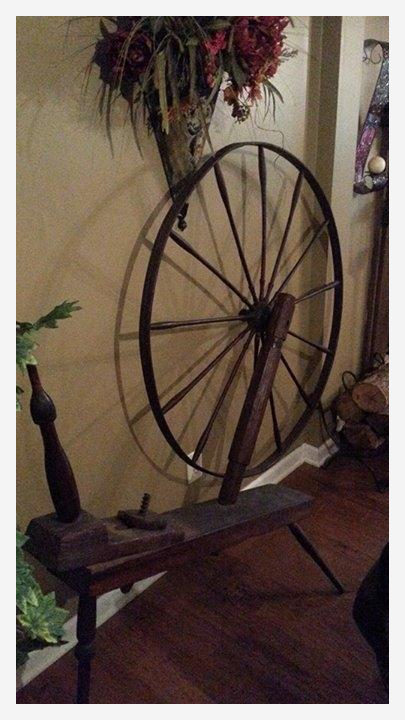 The one thing I’d love to have is this Antique Spinning Wheel, but I don’t have room for it. Made with no nails, only wooden pegs from the early 1800’s. What is your favourite part about being involved with your VarageSale community? Being part of VarageSale is the feeling of being part of a family. From the local members to the VarageSale Team, every admin is special and treated like family. I’m not sure Tami intended it to create such a strong feeling among strangers in the beginning. She really just wanted time to raise her baby. Now that baby has so many VarageSale grannies and aunts and uncles, he needs a database to keep up with them. Or he can just go on VarageSale to find them. Savannah is the Catfish Capital! I was raised to love freshwater fish cooked in different ways. Being in the South, it’s typically fried. Catfish is my very best favorite, drizzled with juice from a fresh lemon with a delicious dish of coleslaw on the side. Oooh, don’t forget the Hush Puppies of course.